LucasFilm Ltd., LLC filed two applications to register STAR WARS: RIVALS as a federal trademark on February 23, but Stars Wars fans don't get excited yet. The nature of the applications is a little unclear. Apparatus for recording, transmission or reproduction of sound or images; audio books; audio recordings; audio and visual recordings; video game software; computer programs and software; downloadable electronic publications; downloadable game software; downloadable mobile applications; consumer electronics and accessories therefor; eyeglasses and sunglasses and accessories therefor; binoculars; decorative magnets; graduated rulers; microphones; helmets; flotation vests; protective face masks not for medical purposes; snorkels; swimming goggles; swim masks (Class 23). Both applications were filed on an intent-to-use basis, suggesting that LucasFilm is not using STAR WARS: RIVALS in commerce in conjunction with the listed goods and services yet, but has a bona fide intention to do so in the near future. Are these applications related to a new movie, videogame, book, or maybe this fan film? Unfortunately, it is difficult to tell. If the "education and entertainment services" in Class 41 were expanded upon, it would be a little easier to discern LucasFilm's intent for this mark. Luckily for fans, LucasFilm will probably be required to expand upon these services before the mark in Class 41 will register, considering the identification is extremely broad but is required to "be specific, definite, clear, accurate, and concise." 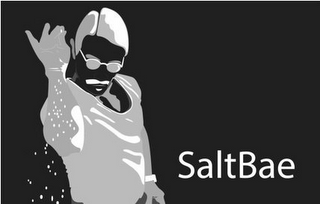 TMEP 1402.01; In re Societe Generale des Eaux Minerales de Vittel S.A., 1 USPQ2d 1296 (TTAB 1986). Not only that, but the multimedia giant must actually start using this mark in commerce and submit sufficient proof of the same if these marks are to register. See TMEP 1103. According to my quick search, these are the first applications for STAR WARS: RIVALS filed by LucasFilm. 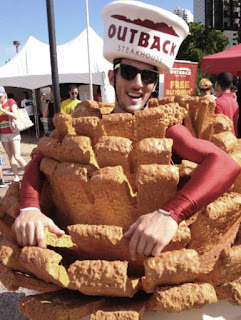 If you love Outback Steakhouse's Bloomin' Onion (which is a registered trademark itself, filed in 1989), you'll love this recent trademark application. On January 31st, Outback Steakhouse of Florida, LLC filed a federal trademark application for the mark below, described as "a three-dimensional configuration of a costumed mascot character with human arms and legs and the body of fried onions on a plate wearing a hat in the form of a dipping sauce saucer. The wording 'Outback Steakhouse' appears thereon." In other words, the application does not cover words or a logo, but rather the costume itself (trademarks are not limited to words or logos). Outback filed the application in Class 41 for "[e]ntertainment services in the nature of live appearances by a costumed mascot at college sporting events, promotions, charity events, special events and other performances." According the application, Outback has been using this costume in commerce at least as early as September 21, 2013. 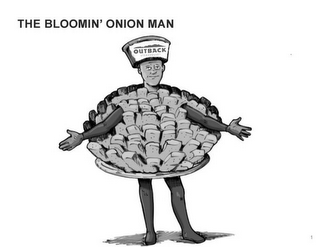 Earlier in January, Outback filed a different application for BLOOMIN' ONION MAN in standard characters (i.e., the words only) covering the same services in Class 41. According to my quick search, Outback Steakhouse of Florida, LLC owns 92 live trademark applications or registrations at the U.S. Patent and Trademark Office. On January 22nd, President Trump's senior adviser Kellyanne Conway famously (or infamously) used the phrase "alternative facts" on NBC's Meet The Press to describe the crowds at the presidential inauguration. That same day, the first trademark application for ALTERNATIVE FACTS was filed with the U.S. Patent and Trademark Office. Over the next week, ten more applications would follow (as of today's date, only applications filed up to January 29th are visible in the USPTO's database). As is often the case when a catchy phrase hits the news, multiple enterprising individuals hoping to capitalize on the term file federal trademark applications. Filing the applications, however, is only the beginning of the trademark registration process. Most of these applications, as with most applications for similar catchphrases, will probably not actually mature into a federal trademark registration. For example, most of the 11 applications above were filed on an intent to use basis, which allows an applicant to file a trademark application before actually using it in commerce (which is typically required to establish rights in a mark), so long as the applicant has a bona fide intention to use the trademark in commerce in the near future. See TMEP 1101; 15 USC 1051(b). Before an intent to use application can register, the applicant is required to submit sufficient evidence to the USPTO showing they are actually using the trademark in commerce. TMEP 1103. For the applicants of the ALTERNATIVE FACTS applications, this means they will need to actually sell the goods or provide the services listed in the respective applications and submit sufficient proof of the same to the USPTO before the USPTO will grant them a registration. Assuming, that is, that there are no other deficiencies in the applications that might prevent registration (i.e., inadequate description of the goods/services, deficient specimen, incorrect classification of goods/services, etc.). If an applicant does not meet all the requirements for registration, the application will be abandoned and the non-refundable filing fees are lost. In sum, while it may be relatively easy to actually file a trademark application, that is only the beginning of a rather complicated legal process, and such a filing by no means guarantees a registration.